Cooler temperatures and lower humidity and (thank goodness) some rain have come along with the start of fall this year. On a recent trip downstate, I saw sweeps of yellow from sweet goldenrod (Solidago odora)—our state herb. Goldenrod often gets a bad rap as the cause of fall allergies. In fact, goldenrod pollen is extremely heavy. It is pollinated by bees, butterflies, moths etc., but not by wind. It blooms at the same time as the inconspicuously green-flowered ragweed. Ragweed has light pollen, is wind-pollinated and is the most likely cause of many fall allergies. Contributing to the roadside yellow were also tickseed sunflower (Polylepis bidens) and swamp sunflower (Helianthus angustifolius). Warm season grasses, switchgrass (Panicum virgatum), Indiangrass (Sorghastrum nutans) and little bluestem (Schizycharium scoparium) are also blooming in great sweeps along our roadways. Fall is the season in which Delaware’s native vegetation shines. Along Route 1, groundsel bush (Baccharis halmifolia) is poised to burst into bloom with white fleecy flowers. Soon our native sumacs (Rhus typhina, Rhus copallina, Rhus glabra and Rhus aromatica) will turn bright red and make a great combination with groundsel bush. The first fall color we see in Delaware is the crimson color of black gum (Nyssa sylvatica). At the northern end of Route 1, the black gums are just starting to show hints of red. 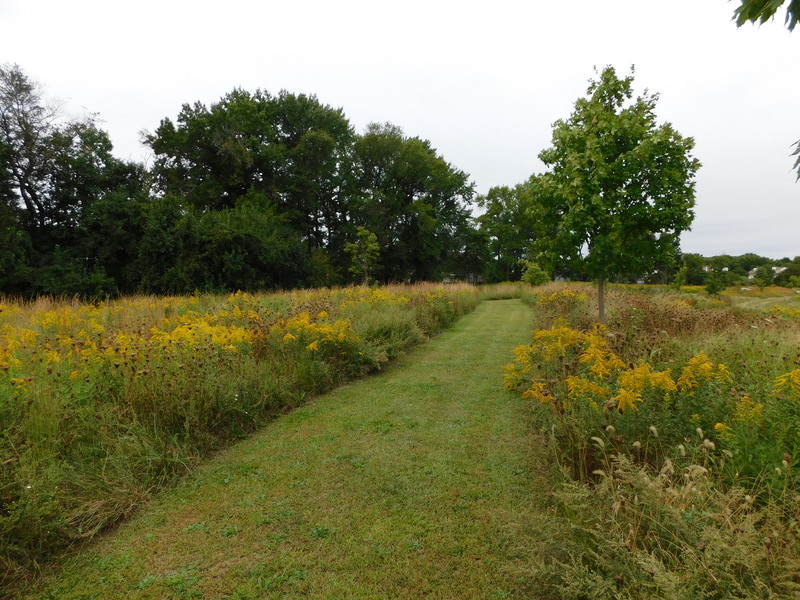 Goldenrod, Delaware’s state herb, blooming in community common land in Northern Delaware. If you want to do more than view our beautiful fall landscape, there are plenty gardening activities best accomplished in the fall. Fall, once we get some consistent rainfall, is a great time to plant most trees and shrubs. Trees and shrubs put energy into root growth in fall, so plants quickly become established in their new sites. One exception is with evergreens, which do not grow many roots as the weather gets cooler and the day length shorter, so avoid planting evergreens in the fall. Perennials can be planted in fall, but if you are planting very small plants or plugs, it is best to wait until spring. Alternate freezing and thawing during winter, pushes small plants out of the ground. Fall is the best time to renovate your lawn. Start by evaluating how you use your lawn. Where do you need circulation? Play areas? Gathering spaces? Or green carpet to unify the scene? If lawn is not serving a purpose, get rid of it. Allow it to become a meadow or forest; or plant landscape beds or vegetable gardens in place of unused lawn. For those areas you do use, a thick, dense lawn will keep the weeds out and serve the intended purpose fully. Grass seed requires good contact with the soil to germinate. If you are over-seeding a relatively weed-free lawn, use a hard rake or core cultivator to expose soil before spreading the new seed. If you are renovating a poor quality lawn, it is best to kill the existing vegetation before seeding. You can smother the existing grass and weeds with black plastic, but if the area is large and full of perennial weeds, it will be more effective to use an herbicide, such as glyphosate. Take a soil sample to determine pH and nutrient deficiencies. Correct pH with lime and add nutrients following the recommendations of the soil test. Next core aerate or till to expose soil. Then spread grass seed. 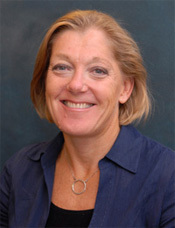 Turf type tall fescue is the preferred grass for all of Delaware. It is drought tolerant and tough enough to withstand modest play and traffic. Cover your newly seeded lawn area with a light layer of straw or salt hay to help keep the soil moist. Water frequently (daily at first) until the grass becomes established. Cut when the grass reaches 3-4 inches with a sharp mower blade. Dull mower blades may pull the seedling out of the soil instead of making a clean cut. Fertilize again once grass is established, usually by mid-fall. The trend is growing. Longwood Gardens has a meadow. Mt Cuba Center has a meadow. Winterthur has several meadows. Isn’t it time YOU manage a meadow too? As people become concerned about pollinators and bee decline or just want to see more songbirds in their gardens, they are turning to landscaping with native plants and one of the cheapest and easiest ways to get more native plants in your landscape is to manage a meadow. Dr. Doug Tallamy, professor of Entomology in the College of Agriculture and Natural Resources at UD and author of bestseller, Bringing Nature Home, was the keynote speaker at the recent American Society of Horticultural Sciences meeting in Atlanta Georgia earlier this month. He spoke about the role native plants play in supporting native insects and more importantly life as we know it. His talk was the buzz of the meeting (no pun intended). I just met with a couple who live in Middletown, DE on about 5 acres. They are tired of cutting grass and managing a lawn plagued by crabgrass. Instead, they plan to focus on maintaining a small healthy lawn right around the house where they want to entertain and play sports. The rest of the property is destined for meadow and maybe ultimately a forest. They started last week manipulating hoses to get the mow lines for the meadow just right. Then, they plan to kill the existing turf with glyphosate (sold as Round Up or other generic products). They will core cultivate to open up holes in the soil and improve seed/soil contact when they seed. They may use the sawdust method, which involves mixing meadow seed with sawdust and spreading a one-inch layer over the entire site. The sawdust provides a good germination medium for the seed and prevents light from reaching crabgrass and foxtail seed reducing their germination and encroachment into the new meadow. The best time to seed a meadow is late spring, but now is a great time to start deciding where your meadow will go. Just stop mowing the sections of your lawn that you want to turn into meadow and see how it looks. You will get a sense of the shape and feel of the meadow, before it is time to seed next spring. The gardens I mentioned earlier do a great job of using cues of care to indicate meadow management. 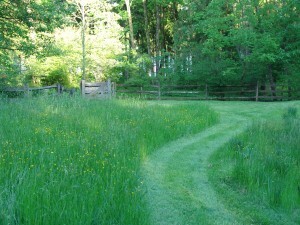 Mow edges around your meadow and mow curving paths through the meadow. You can add artwork to the meadow or plant native perennials at key intersections or edges. 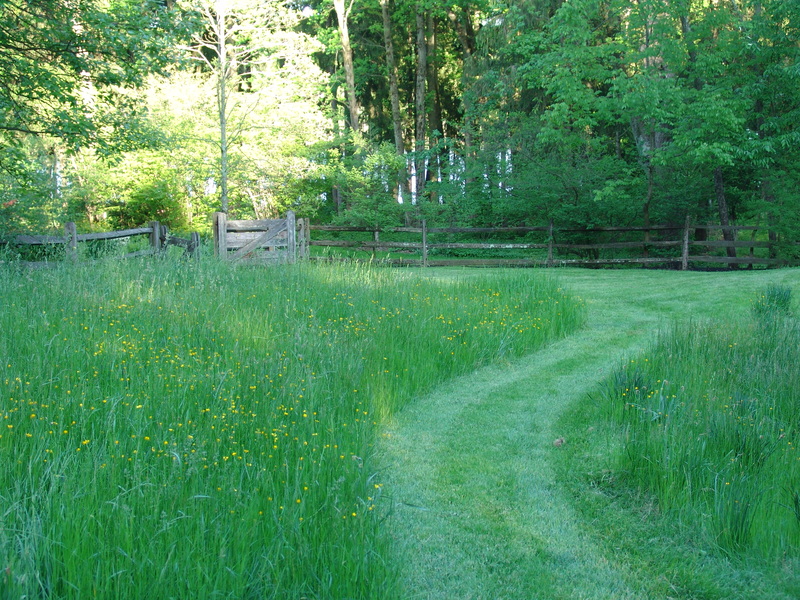 Path mowed in a backyard meadow. I have a bee-keeper friend who is taking the simpler route to meadow establishment. He simply stopped mowing his lawn. He is still mowing a circular area off the back patio, but the rest of the backyard is starting to grow tall and will hopefully provide nectar for his bees in a year or so. He needs to apply those same cues of care, by mowing a path from the end of the driveway to the mowed section. The clean crisp line between mowed grass and meadow is critical. It will take a bit longer to establish a native plant meadow with this method, but eventually native warm season grasses and perennials, like common milkweed, will grow. A middle-of-the-road strategy to jump start the meadow is to open up the soil and plant pockets of native grasses and perennials, either from seed or plugs into the now tall lawn. These plants will eventually produce seed and spread into the surrounding meadow. You can’t just throw seeds onto an existing lawn, though and expect them to germinate. Only seed that stays moist and is in contact with the soil will grow. To manage a meadow, plan to mow once a year in early spring, and possibly again in late June. This will keep woody plants from taking over the meadow and still allow the native plants to flower. Jump on the meadow bandwagon; do your part to encourage wildlife; and help provide the ecosystem services we need right in your own home landscape!